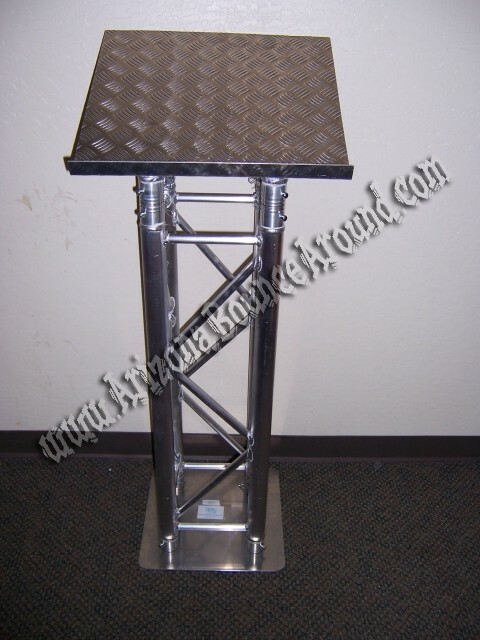 Our beautiful aluminum truss Lectern Podium will look amazing at your event. Much more modern that trational wood podiums and very light weight. Our lectern has a large angled top with a big ledge to hold laptops and reading material. Dont get stuck with an outdated lectern podium at your speaking engangement when you can rent this one. We can also attach a 55inch flat screen monitor to the from for slide shows or presentations before, during or after you speak. Add a LED truss light to the bottom for only $39.00 for an awesome effect.